Wendy Hunter is a volunteer with the Animal Rescue of Fresno. ARF shares with KRL their animal rescue adventures every month. In the animal world, there are lots of cute critters. Like the sea otter, with its whiskered smile and crab-cracking skills. Or the mischievous meerkat, popping up from his burrow, searching for spiders and snakes. And then there’s the hedgehog, a little ball of prickly delight that fits right into the palm of your hand. Yup, there are many creatures out there that genuinely seem to captivate people. But one in particular continues to hold the title of fan favorite. Behold, all the adorable awesomeness that is the panda bear. They’re roly-poly packages of fuzzy fun, who make adults grin, and bring squeals of laughter to little ones everywhere. From their black-ringed eyes and cotton candy tongue, to their unabashed enjoyment of somersaulting down hills, they are the epitome of happiness. In their native land of China, the panda bear is considered a national treasure, and regarded as a symbol of heroism and peace. At Animal Rescue of Fresno, we now have a heroic treasure of our own, who’s just lucky enough to BE in one piece. Behold, all the whimsical wonderfulness that is Panda, a quirky character who’s sweeter than a black and white cookie. 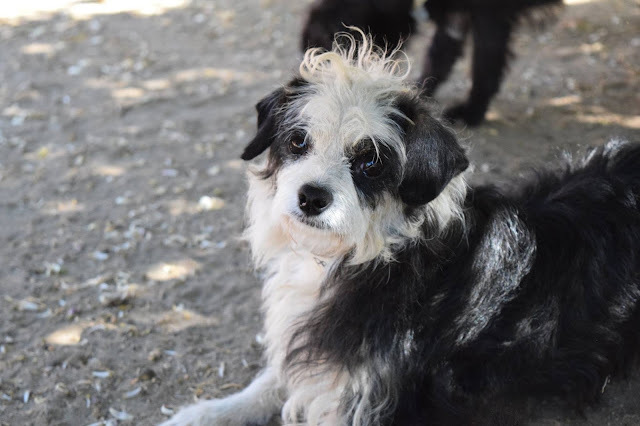 Panda is a three-year-old Chihuahua/Terrier mix, though there might be some poodle lurking in there somewhere. When you look into her lovely amber eyes, you’d never know the sad story hidden behind them. You couldn’t imagine anyone wanting to hurt her. It’s impossible to believe that a person could be so cold-hearted. Unfortunately, there are some horrible humans inhabiting our planet, and Panda was a victim of somebody very cruel. This unsuspecting little girl was callously thrown from a van on the freeway, where she landed on her head in an orchard. No, I’m not kidding. A Good Samaritan was behind the van, watched it slow down to the curb, and saw Panda literally being tossed out the door. Since she was undoubtedly stunned from the fall, the Good Samaritan was easily able to catch her without a chase. Regrettably, Panda’s savior was unable to get the van’s license plate number, so the culprit got away with it. The Good Samaritan was on her way to work, but thankfully took the time to drive the injured dog to a local kill shelter. 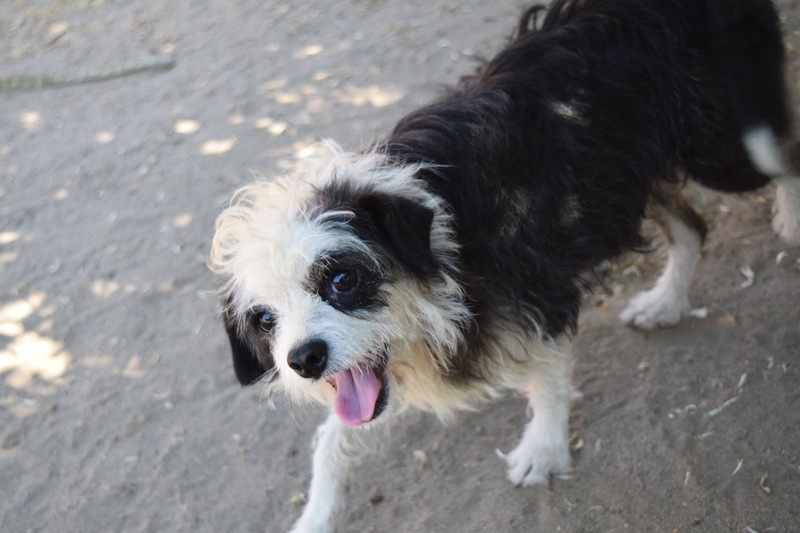 However, that particular shelter did not have a budget for medical cases, which is how Panda ended up at Animal Rescue of Fresno. If Panda’s tormentors had even a pea-sized shred of decency, they would have just dropped her off in the vineyard. Instead, they chose to hurl her from the van, where she came down in the worst possible position. The veterinarian who saw Panda was concerned about any residual swelling she might have, but she seems to be doing very well. In addition, head trauma may cause seizures in dogs, but miraculously, Panda has not experienced any so far. Because of the damage, Panda now suffers from neurological effects, such as a permanent head tilt. This cockeyed look makes her appear quizzical and curious, as if she’s asking an incredibly important question, such as, “Hey, was that the dinner bell?” When Panda first arrived at ARF, she constantly spun in circles, another neurological effect. These days, she walks normally, and only seems to spin when super excited about something (treats) or somebody (okay, everybody). I can personally attest to the fact that she absolutely adores tummy rubs, and snoozing in a warm lap. Need to brush up on your beauty skills? Panda will patiently let you practice your pigtails, pompadours, and punking out her hair with a rockin’ Mohawk. The saddest part about Panda’s ordeal, is that it’s not an isolated case. In February of this year, a Massachusetts truck driver was reunited with his dog, a month after it was stolen. Tedge was tossed from a moving SUV, and later rescued by two Good Samaritans. One of his hind legs had to be amputated, but after recovering, he was back on the road with his owner. In October 2017, a 100-pound dog was euthanized after being thrown from a moving car in Georgia. That same month in Washington, a man was seen shoving a sick dog out of a minivan. The Seattle Animal Shelter said the dog was in clear medical distress when he was pushed; the adult Pit Bull did not survive. The shelter’s director called it, “A very disturbing case of callousness and an act of animal cruelty.” In June 2017, an Illinois woman observed a Puggle being thrown from a moving SUV. She recalls, “It was just tossed from the car. I thought that was one of the cruelest things.” The local police chief angrily agreed, “That person could have taken it to a shelter. There are so many options out there. To do this is utterly unbelievable.” “Misty” was later returned to her panicked owner, who said, “I just can’t believe someone would do this. We need to get this person off the street.” And back in December 2016, a small dog was tossed from a car on Christmas Eve, in Carson City, NV. One shaken witness said, “I want to see these people…that’s inhumane. That’s worse than inhumane.” The Terrier mix suffered from a broken pelvis, and a severely broken leg that was ultimately removed. The Nevada Humane Society named him Tiny Tim. Even though it may not seem like it, Panda is actually one of the lucky ones. If it weren’t for the compassionate woman who stopped to rescue the poor wounded soul, her story may have had a much sadder ending. Panda could have been out in the elements for days, disoriented and in pain, desperately looking for food and water. She would certainly have been easy prey for larger strays, unable to defend herself. And with her injuries left untreated, our brave little bear may have crossed over the Rainbow Bridge much too soon. If you’re wondering how a person is capable of taking a living, breathing animal, and chucking it from a moving vehicle like it’s a bag of garbage, you’re not alone. Every time I tell Panda’s story to someone, they look at me in disbelief. I suppose there are a myriad of reasons why people are able to talk themselves into committing such an act, like the dog is getting too old, or they can’t afford vet care, or the dog is misbehaving. It’s possible they just get a sick thrill out of it. Since these criminals have no morals or a conscience, maybe they’d think twice if they knew it’s actually illegal to dump an animal. According to CA Penal Code 597 (Cruelty to Animals), anyone who maliciously and intentionally maims, mutilates, tortures, wounds, or kills an animal, can be fined $20,000 and/or imprisoned for up to a year. I’m sure any dogs that have survived the terrifying experience of being pitched from a car, would be more than happy to lock the cell door and throw away the key. 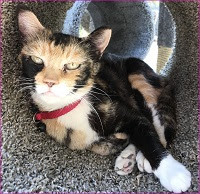 For Panda, life is good out at Animal Rescue of Fresno. She loves playing with all her pals, enjoys relaxing under the orange tree, and always greets volunteers with a wagging tail. I’m always amazed that dogs can be so forgiving towards people. If I had been through Panda’s ordeal, I don’t know that I would be so trusting. But, just one look at that scruffy face, and you can tell she has a lot of love to give. Panda would truly thrive in a home as an only dog, where she’d receive tons of affection. However, since she’s in a yard with several other dogs all day, she’d do well in that kind of environment as well. Sometimes, I speculate on what Panda’s previous life might have been like. The events that led up to her being tossed like yesterday’s trash…like she had no feelings…like she was nothing. Did she know what was happening? Did she sense something was wrong? I hope whoever forced her out of that van is guilt-ridden. I hope they have trouble sleeping at night. And, just before they threw her out the door, I hope Panda had the chance to bite them square on the knuckles. Man’s best friend, indeed. 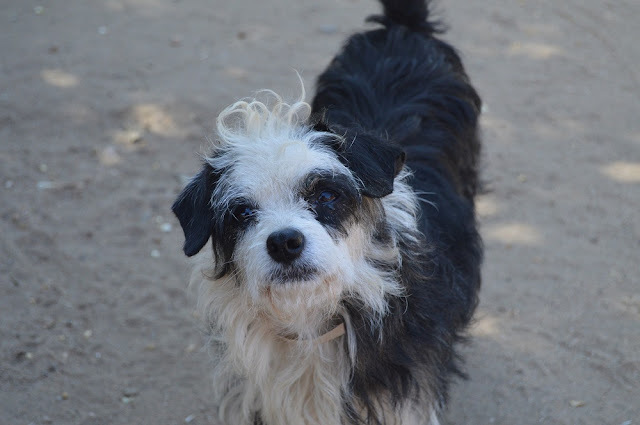 If you think Panda would be the perfect fit for your household, come on out to Animal Rescue of Fresno and meet her! Wendy Hunter has been volunteering with ARF for just over a year. She grew up in Fresno and recently became an Office Assistant with Fresno County. She has been writing all of her life, though never professionally, and currently writes personalized poetry for birthdays, weddings, pet remembrances, etc.